Beau thanks everyone for their wonderful suggestions regarding his name. Scamper, Nomad, Mcneil, Gulliver, Tibble, Shakespeare, Cointreau, Lucky, Garcon, Noel, Gabriel, Drake, Osborne, Sylvester, Richard, Casper, Ross, Bilbo, Galileo, Griffen, Gordon, Giscard, Gaston, Gustave, Glee, Oliver, Dwight, Gateau, Graffitti, Gorgonzola, Harley, Felix, Bailey, Cody, Wilkie (and that’s not even ALL of them!). He also begs you to forgive him the time its taken him to decide–actually I think he likes the attention and has been stringing us all along…..
We like his choice because he reminds us of the late much-loved Beauty–the white wonder, who we thought was a female until the vet told us otherwise! Wonderful name for an adorable kitten!!!!!!!!!!!! He chose wisely and well. Congratualtions on the newest member of your family!!! I love the name. ps made the brussel sprout soup and it is wonderful. Try offering fresh asparagus to your felines. Even thought they are true carnivores, they love it and it is healthy for them. will do when it comes into season again! Well, he is beautiful, so the name fits. Congratulations with your new name, Beau, and I hope to read a lot of wonderful stories about you…. So glad he has a name now and eminently suitable too. Long life and prosperity, young man!! What a beautiful name! Hope he is being accepted by the other furry ones in the family. Pippa remains hostile but there are signs she becoming resigned. Awww….poor Pippa. Is she one of the outdoor cats or indoor? Would love to see a photo of all your kitties sometime. on December 13, 2011 at 5:53 pm | Reply Melanie O. Good name and wishing Beau many good years in beautiful France! It’s blowing a gale now and also raining in Belgium for the moment. I like it too! Pretty boy, Beau. Had a female years ago named Cheetah, found a white 5wk old feral kitten in the road later, had to name him Tarzan. on December 13, 2011 at 9:08 pm | Reply Dianne P.
I’m sure that Beau knows that his name is ‘particular’, but I wonder what he calls himself???? You will know this brilliant poem, it could not explain the difficulty of naming a cat any better!! I look forward top reading more about the kitten capers!!! Beau, you are a scene-stealing imp. That pink nose is plucking everyone’s heart strings. Robin, your herd might like a few drops of Rescue Remedy in their water bowl. Especially Marmalade. Always works well for my critters. Thank you for sharing the wonderful recipes! Thanks for that idea, we will do that. What a very apt name for a very hondsome puss.Beau. Did you ever find out how Beau came to find you,perhaps he was left by someone unable to take care of him, and new that he would have a loving home,or maybe he just liked the look of your garage knowing the same thing – he would be cared for loved and save. We think someone left him. The vet said yesterday his teeth developement made him think Beau was more 2 months old. His condition was good-ie cared for-he doesn’t act as though he’s been abused. Perhaps the person just couldn’t cope. Anyway whoever it was/is has done us a huge favour! He’s a peach and it was tempting to call him that!! Look forward to meeting Beau, he looks great and full of cat-fun! We too have a ginger tom of 8 yrs also with bad teeth. His sister too has dental problems and my husband cleans their teeth daily with a finger brush and fish toothpaste (yum) – it really has helped and hes got all his fingers! 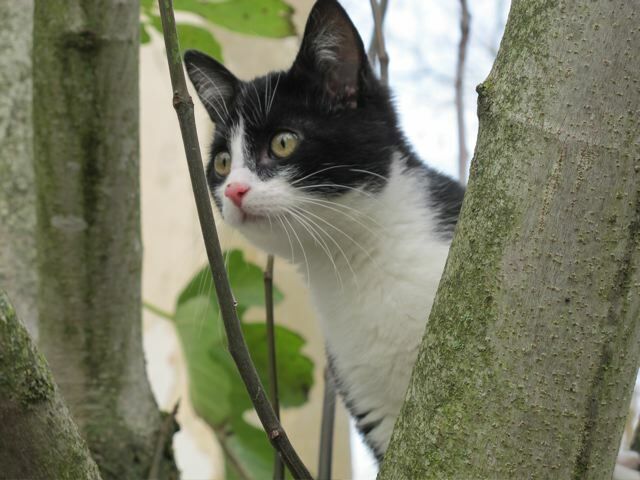 I love Beau – gorgeus kitten – black and white cats are the hardest colour to rehome in Uk apparently – so sad they are lovely. The report on diabetes made my heart sink. As Practice Nurse I am under pressure from the PCT and Gp’s to give advice, support and info to Diabetic Patients, The more enlightened I have pointed in your direction for good recipes as diet can become monotonous. Hope you had a good Christmas and Happy New Year to you,your wife and menagerie. Thank you, Alison–A very Happy New year to you and your brave husband too! Beau is napping comfortably on Meredith’s left leg. He is delightful and as good a dribbler of a ball as Beckham!